From: Carter, Kate B., ed. Our Pioneer Heritage. 20 vols. Salt Lake City: International Society, Daughters of Utah Pioneers, 1958–1977. v. 1, p. 33-37. Elsie Edge Booth was born December 21, 1825, in the little town of Leigh, Lancashire, England. She was the daughter of John and Sarah Davis Edge. Her father's ancestors were English, but her mother's grandfather came from Wales, which may account for Elsie's great love of music and her beautiful alto voice. Her father died in his early manhood, leaving the widow and two daughters to face life's problems as best they could. Educational facilities in England among the working classes were meager. One of the main industries in Leigh a century ago, as now, was the manufacture of woven fabrics, and at an early age Elsie was taught to weave silk. The following story was written by her daughter, May. Elsie Edge was not quite twenty-one years old when she was married August 14, 1846 to Richard Thornton Booth, who on that date, had reached his twenty-fifth birthday. He, though born near Bolton, moved at an early age to a little village called Bedford, about three miles from Leigh and as the two villages expanded they merged into one—Bedford-Leigh. Both young people were earnest members of the Wesleyan Methodist Church. Shortly after their marriage Father heard the Gospel message of the Latter-day Saints and soon became convinced of its genuineness; but it took an entire year of study and prayer before Elsie was thoroughly converted to the new faith. In later years she ofttimes said: "It took a great deal of effort to get me into the Church but no amount could get me out. The Gospel is dearer to me than life itself." And her words were vindicated by her actions. For nearly ten years Father and Mother gave devoted service to the Latter-day Saint Church in their native land. While they were saving means to emigrate to Zion, Father labored as a local traveling Elder with much success. In the meantime two sons and two daughters were born to them. By this time Father, through diligent effort, had secured a position with a coal mining company to weigh coal and keep books. In the year 1857 my parents embarked with a company of Saints at Liverpool on the ship "George Washington", bound for America. My Grandmother Edge was unable to accept the Gospel. Her only other child, Betty, had died in early married life, so it was a great trial to all when the separation came between the mother and her only living child, as Elsie felt impelled to accompany her husband to "the promised land." Due to rough seas and unfavorable winds the sailing vessel was three weeks in crossing the Atlantic. A delicate state of health, coupled with extreme and continued nausea, made a voyage a very trying one for Mother. At Council Bluffs Father secured two wagons and two yoke of oxen for the journey westward, to be taken in the Jesse B. Martin Company. Father drove one team while the other was driven by the eldest son, John Edge Booth, who was ten years old. The company was just ahead of Johnston's Army and the strange, wild rumors concerning the intention of the military detachment to exterminate the Mormons furnished no encouragement to the weary travelers. Many treasured articles brought from across the sea had to be discarded by the wayside as the journey lengthened, and food had to be rationed to men and teams as the burden grew too heavy for the wearying animals. One day mother and a companion thought they would lighten the load and enjoy the exercise of walking for a while, not realizing that the line of march could not well be broken and that her delicate state of health might prevent her keeping up; but, thus it happened, and they were obliged to walk several miles before the caravan rested a sufficient time for the women to catch up. They were near what was then known as the Big Sandy River—now the Platte—in Nebraska, and before another day dawned, on August 31st, a fifth child was born. Their covered wagon had to serve as a hospital and for twelve successive days she, and the infant, were jolted over rough roads in a springless bed until the company arrived in Salt Lake City September 12, 1857—five months after the embarkation at Liverpool. They found many kind friends in Zion and were soon comfortably located but their stay in Salt Lake City was short, as students of early history know how the troops were kept out through the winter and when in the summer they were permitted to enter the city, the Saints had already moved and found new homes. Among the places suggested to my parents was a little place thirty-five miles southeast of Salt Lake City then called "Mountainville," though its official name was Alpine. To Mother's beauty-loving soul the name appealed, and there they went with another family named Adams. The Moyle family, who had come a year earlier to Utah in the handcart company, went thither also. They found no vacant houses so they were all obliged to make dugouts in the hillside and live there until log houses could be obtained or built. Into this room with its floor and walls and roof of earth my parents took their little brood of five and called it home. A few months later Father was fortunate in securing a commodious log cabin formerly occupied by the Wright family of Ogden and later by the Preston family who had located in American Fork. The log cabin was used as a sleeping room for the boys for years after the Booth family moved into a modest cottage of stone and adobe. But whether living in a dugout, log cabin, or cottage, whether the fare was meager or abundant, friends always found a spirit of warm hospitality in our home. Mother was a natural teacher of the young. Father and Mother were progressive and kept abreast of the times through newspapers and good magazines which were provided liberally even at the sacrifice of better food and clothing. In addition to assisting Father in teaching the town school in the winter, Mother conceived the thought that children would be better off if a short-term summer school were held, than if they were left to roam the streets; so, during each of several years she conducted a ten week's course in "The Old Meetinghouse." She not only taught the children to read, write and spell, but she taught them geography in her own impressive way, to sing little songs accompanied by motions, to play games, to do little acts of courtesy and many other features that made the school house a delight to the children. In geography class she used an apple to illustrate the shape and rotation of the earth. While the children were at recess the older boys would sprinkle and sweep the floor so that when the class reconvened, the members, in answer to questions from prescribed text books, would be asked to find an island, a river, lake, peninsula, cape, bay, etc. using the wet and dry positions of the floor to represent the land and water of the earth's surface. In those days the men cut their grain with scythes—laid it carefully in bundles and deftly bound it by hand, but there were many stray stalks of precious wheat which could not be gathered in without too much loss of time. The grain saving movement was just begun in the Relief Societies and every one was urged to save against a time of future need. On occasions, Mother used to take her little flock after school to glean in the fields from which the shocks of grain had been hauled. The children made a line across the field and then went forward gleaning every possible stalk. When the field was clean all would sit down and sort the stalks. The fine long, smooth ones had the heads of wheat clipped off and the straw was laid in neat piles to be taken home and soaked over night to toughen. Then the girls were taught to braid it. I well remember the first Fair held in Alpine within my lifetime. Mother had been to Salt Lake City to take a course in obstetrics from a Dr. Barker who came from the East to teach. While there she also learned how to work mottos—make lamp mats, fashioned by winding yarn around pegs that were fastened in a frame, tying the squares and then cutting the upper half, leaving fluffy balls on top. Photo frames were made with cardboard cut in the shape of a star on which the photo was laid and held in place by winding bright colored yarns symmetrically around. Old, as well as young, took a vital interest in this new venture, and so, lovely quilts and many other beautiful things were made for this event. Father kept abreast of the times along the road of medicine and served as family doctor for that little town for more than thirty years. In his ministry among the sick he was ably assisted by Mother who seldom failed, after learning of the need, to prepare "gruel" soup or other nourishment, to send it by one of her children to the sick. Following the arrival of my parents in the Valley, five other children were welcomed into their home, making in all six sons and four daughters. All of these grew to manhood and womanhood; and all but one or two had training either at the University of Deseret, or the Brigham Young Academy. When Mother embraced the Gospel her relatives on her father's side felt that she had brought disgrace upon their home and name, and when ten years later she left to come to Utah they were still bitter. Twenty years went by and, then in 1877, Mother broke the silence by writing a long letter to her favorite aunt. In it she told the story of that score of silent years, of the struggles, and the joys, of the children, and their progress, and then again she bore a marvelous testimony concerning the divinity of the cause she had espoused, and expressed her deep gratitude for the absolute knowledge of its truth with which she had been blessed. The letter was answered. The aunt was glad for word from this favorite niece. Time had changed the bitterness of imagined disgrace into mere sorrow because of the separation; so she answered, telling also her life's story through the intervening years, and added: "We will continue to write; we want to know more about your family and of your welfare, but please do not write concerning your religion." This letter was preserved and forty-eight years afterward it was my privilege, while in England to visit the youngest daughter of the writer in Leigh. The wonderful way by which I found our cousin in a Chapel and her insistence that I make a visit to her home, forms another story. After a few lines of her mother's letters were read, she interrupted for a moment to get a small box from which she brought forth the letter from my mother. We sat as in a dream visiting with our mothers through their words penned well nigh half a century before and preserved by two daughters who until that day had no idea of the whereabouts or existence of the other. Through this unexpected meeting I was taken to the house where Mother was born, to the chapel where she sang, to walk the streets she walked, and to view the scenes she loved so well. Few happier days have come into my life than the ones I spent in Leigh.As I journeyed back to Liverpool with my youngest son, it seemed almost as though my mother also had been with me. From: Heart Throbs of the West, Kate B. Carter, Vol.4, p.467-8. Elsie Edge Booth, daughter of John Edge and Sarah Davis, was born in Leigh, Lancashire, England, the 21st of December, 1825. She was married to Richard Thornton Booth on August 13, 1846. She was baptized July 2, 1849, into the Church of Jesus Christ of Latter-day Saints and in the spring of 1857 the family left England for Utah. They arrived in Salt Lake City September 12, 1857, in the Jesse Martin Company. Her youngest daughter writes of her: "Mother had in her nature a profound love for the beautiful. In the stories she told of her native land she seldom mentioned the things that were unpleasant, but her descriptions of the lovely green lanes, of the velvety lawns where daisies grew, of the magnificent old trees—these lingered always in my memory and filled me with a deep longing to visit the homeland of her youth…. But even better than she loved her native land, she loved the mountains that surrounded the little home in Alpine. There was poetry in her soul and though lacking in technical training, she still wrote as it welled up within her…. Once as I sat beside her on a lovely summer night when a full moon had just risen above the eastern mountain peak, she told me how she longed to write, and then recited a few original stanzas." She died July 10, 1893, and was buried in the shadow of the mountains she loved so well. —Sung at the dedication of the Salt Lake Temple. From: An Enduring Legacy. Salt Lake City: International Society, Daughters of Utah Pioneers. v. 1, p.417 (Submitted by May Booth Talmage). Elsie Edge Booth was a person so exuberant with joy for beauty that it overflowed her soul and reached out to others through her beautiful poetry and music. She was born in Leigh, Lancashire, England, December 21, 1826, a daughter of John and Sarah Davis Edge. Her parents were poor but Elsie managed to learn to read and write and always maintained an eagerness to learn. Her mother's father was Welsh, probably a factor in Elsie's love for music and the cultivating of her lovely alto voice. As a child and young woman, Elsie sang in the Methodist Sunday School choir. At twenty-one years of age she married Richard Thornton Booth, August 14, 1846, and shortly thereafter they were introduced to The Church of Jesus Christ of Latter-day Saints. After a year of study, she accepted the gospel and always maintained that no one could dissuade her from believing its truthfulness. The Booths emigrated to Utah Territory in 1857, traveling from Council Bluffs in the Jesse B. Martin Company. They settled in Alpine, the beautiful village situated in a cove of the Wasatch Mountains in what later became known as Utah County. Here they established a home of culture and learning for their ten children. Mrs. Booth continued her music and writing, and commenced a summer school in her home for preschool children. Quoting from her daughter's story of her mother's life: "At these ten week sessions, she not only trained her children to read, to write, to spell, but she taught them geography in her own impressive way, to sing little songs accompanied by motions, to play games, to do little courtesies and many features that made the school hours a delight to the children. In geography class she used on apple to illustrate the shape and rotation of the earth." Mrs. Booth taught this special class for seventeen years while maintaining her home duties. During this time she was also president of the Primary and secretary of the Relief Society. Much of Mrs. Booth's poetry was written about the natural things of life in and surrounding the community—mountains, trees, streams, people and events of note. Her words of poetry were set to music and sung at the dedication of the Salt Lake Temple. 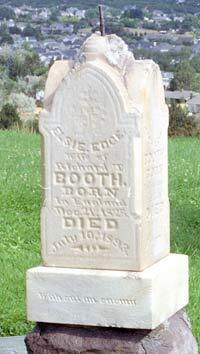 Death came to Mrs. Booth July 10, 1893. To the city of Saints, 'tis the land of the blessed. And gather with us in the land of the West. Will strengthen the Saints, both the aged and youth. And eat of the fruits which that land doth increase. Where none shall molest us or make us afraid. In these as ancient days the same. Which beams on us with gladdening rays. Where we may learn Thy righteous ways. It is a holy house of God. A house of glory, order, too. "Lo, I will come and dwell with you." And never more be found at all. The pleasing wonders of a Savior's name.